Click the button below to add the Wall Mounted Reader 13.56Mhz for Access control,MIFARE, Wiegand 26 (GY8511) to your wish list. Wall mounted RFID readers are water proof, can be used in outdoor environment. There are many readers to support different RFID technology, including LF, HF and UHF. GYRFID presents different kinds of Card readers to support the RFID tags and tags working, including Proximity reader and long range readers. 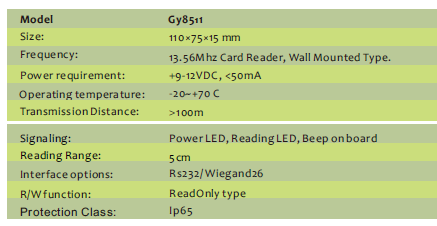 Gy8511 is a kind of wall-mounted type reader, it supports 13.56Mhz Mifare card. It is widely used for access control system which mounted on wall and connected with a controller. 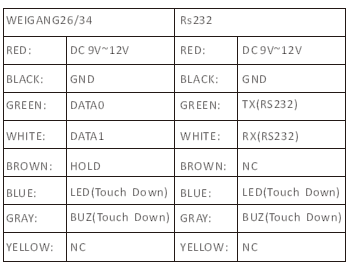 It has two interface options Wiegand26 or RS232 type.It has the advantage of compact size and reliable ability.